The Wabbit fished in his fur for his salad sandwich and finally found it. The lettuce was limp, the carrot was curled and faded. And as for the bread it was hard as a board. But the Wabbit was hungry and his stomach rumbled and he hauled the sandwich out. But he didn't get to take a single bite. 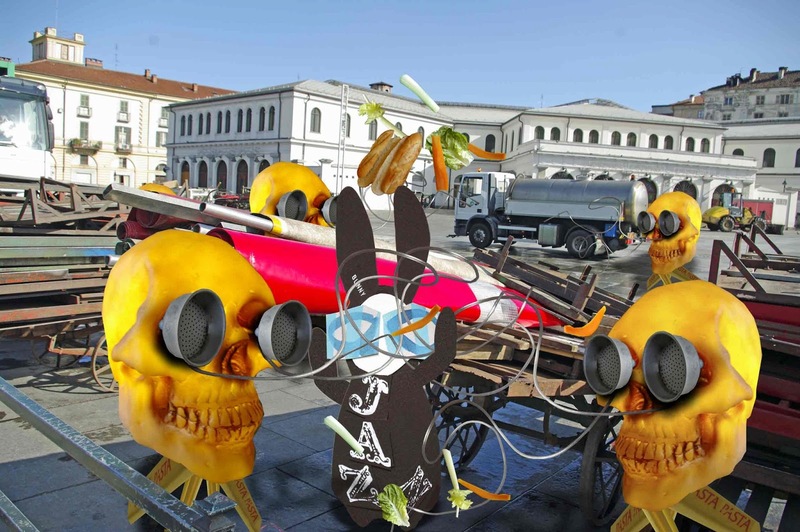 Yellow Gnamskulls descended from different directions and the place was awash with foraging tubes. Carrot shavings and lettuce leaves instantly liquidised as they were drawn through the tubes and into the cavernous eye sockets of the Gnamskulls. The Wabbit spluttered. He didn't like being taken by surprise and in his heart of hearts he knew he had plenty of warning. "Leave my sandwich alone, you beasts," he cried. But the Gnamskulls took no notice. He shouted louder and louder, yet the more he shouted, the more they ate until the Wabbit realised they couldn't hear. He found this totally infuriating and shouted more loudly. "I'll grind your bones for glue!" he raged. This had no effect whatsoever and the Gnamskulls continued to eat his sandwich. "I hope it chokes you!" shouted the Wabbit - but he noticed they were suddenly finished. And they all turned to look at him. The Wabbit shrugged and looked back. "Coffee and biscotti?" he asked.